This game was completed in 72 hours for the 39th Ludum Dare, using the required theme of 'Running Out Of Power'. 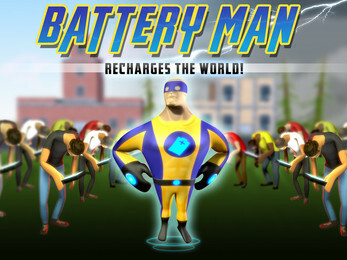 Restore power to the world (after accidentally absorbing it all) whilst holding back phone addicts in need of a power source! Awesome enemies! Four awesome enemy types eager to drain your battery, including owners of the explosive Sumsing Universe Note 70, and phone addicts with wireless chargers! Zapping and spinning! Zap enemies to charge their device's batteries and hold them back. Zap and spin on top of generators to activate them! Backstory! Want to know why you're putting all these generators back up? Well, enjoy our little opening sequence to set up some context for the action! Epic music! Recharge your batteries with energizing level music and superheroic title music. MOVE with W/A/S/D or Arrow Keys. SHOOT ELECTRICITY with left click. This was really fun and kinda cartoonishly cute. Its always nice to have a game that quickly sets the stage with a short little story. The enemies felt very on point and super accurate to the times we live in today. As a bunch of technology addicted zombies that crave power to play on their smartphones. Etc. I don’t have a lot of specific feedback for this one. It feels super solid and like a more or less complete game. The only thing I can think of would be to add some more variation in the enemy’s appearance. Like a crab walking/spider looking creature that used to be a power in a power chair could be fun. I would say you should definitely expand this game a bit with more story and more levels. It’s got just the right amount of cartoonish humor, a fun zappy superhero, and simplistic graphics. Great entry for ld39! Loved it! I love the different enemies, and having to conserve my power while dealing with them! I had a lot of fun playing it! Nice job and good luck! Hey there, I completed this game and it was harder than I thought, but I am pleased to add this to my Ludum Dare 39 collection. 5/5.